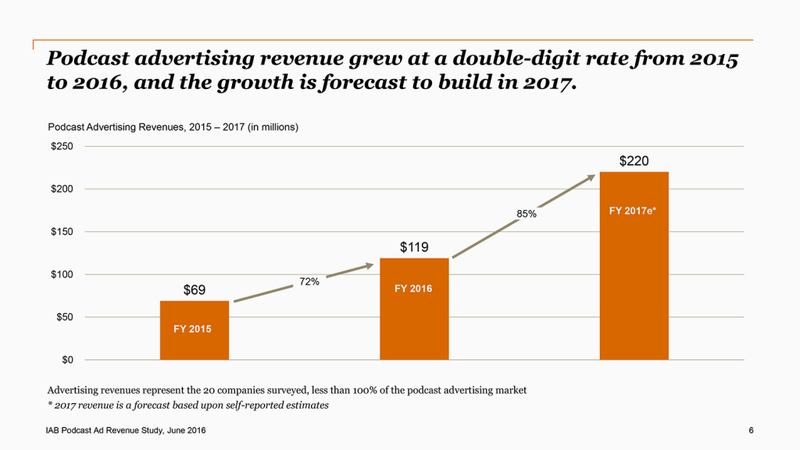 According to a recent study by the Interactive Advertising Bureau (IAB), ad revenue from podcasts is about to go way up. Last year, podcast ad revenue was about $119 million; this year, that number is projected to hit $220 million. Thus far, a podcast’s success has been measured by number of downloads; beyond that, however, many advertisers have had little sense of how many people are actually listening to their ads, beyond tracking promo code usage. (Ad skipping is a phenomenon in podcasting, too.) Podcast creators, too, received little feedback. But as Apple beefs up its podcast analytics, advertisers and creators alike can be smarter about how they spend their money. So while IAB’s study indicates that advertisers will be pouring a lot more money into podcasting, the podcast ad biz is still young, so we don’t want to make any proclamations just yet.